Thanks to Heather Booker (Cadwallader) for the photo and text. 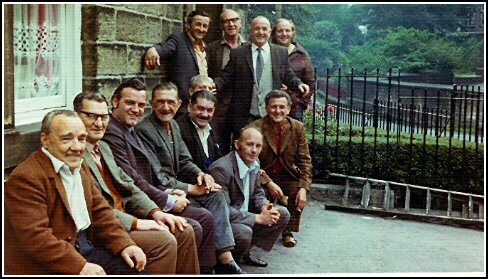 "This is of a group of men outside the Kings Arms in Sutton I don't know what the occassion was, when my dad was in his early forties, he is now near on seventy three. My dad is the only survivor of this photo. The names are as follows. Starting from the front sat down going along the back and back round to the front and my dad crouched down (Charlie Cadwallader). Paddy Reape, Harry Birch, Terry Cryer, Paddy McCormack, George Howard, Harold Cunliffe, John Leach, Hector Watson, Jack Curry, John French, Bob Curry and my dad Charlie Cadwallader."